This dissertation proposes a modular trajectory controller that employs the full nonlinear kinematics, which are derived based on the kinematic equations of motion. The general kinematic equations of motion are written in a certain form that eases the application to the full nonlinear kinematic error dynamics of second order. As the kinematic error dynamics are free of uncertainties except for sensor errors, the method of nonlinear dynamic inversion, also known as feedback linearization, is used to transform the error dynamics for control. While the feedback linearized form enables the control engineer to specify the error dynamics as desired, the nonlinearities contained in the kinematic error dynamics of second error exhibit feedforward characteristics that aid to keep the tracking error small. Given a sufficiently smooth trajectory, the feedforward components would suffice to follow a geometric path in the absence of inner loop and actuator dynamics. Consequently, the feedback error control of the trajectory controller primarily deals with these dynamics and external disturbances. Although the trajectory controller’s general derivation is designed for full trajectory control including timing, the design is relaxed to three-dimensional path-following control when applied to the Institute of Flight System Dynamics’ flying testbed, a DA 42 general aviation aircraft. In this context, the author’s contributions to the modular flight guidance and control architecture along with integration activities required for flight-testing and operation of the DA 42 are depicted. Specifically, the modular architecture is presented and set into an operational context, where consistent mode switching, different stick laws, and the efficient model-based development approach towards flight testing form the central aspects. The command transformation between the outer control loops and the inner control loop is another contribution of this dissertation. 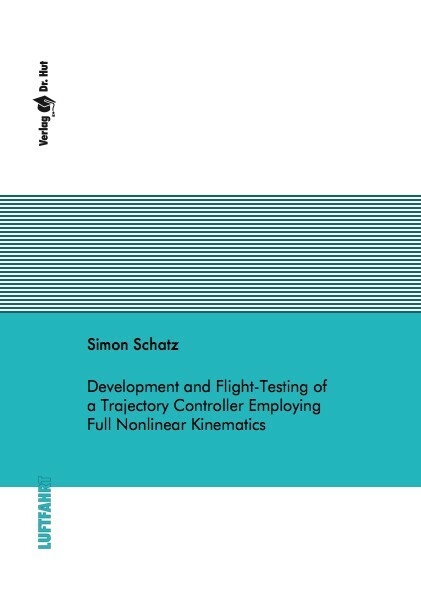 An extensive analysis of the proposed controller in both simulations and flight tests is presented, where different maneuvers, environmental conditions, and aircraft are considered to stress the proposed controller’s efficacy, performance, and modularity.